This is the view from the front door, looking into the atrium. Originally the atrium was about 90% concrete patio, with some small planting areas around the edges. 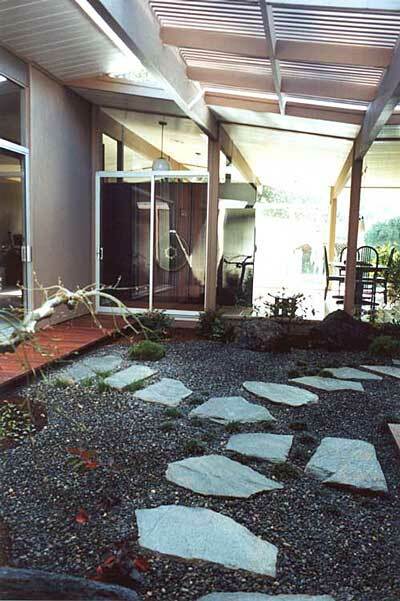 In February, 2001, we had the concrete removed, the low wood decks built (which are called "engawas") and this Japanese-style garden installed. At the top of the photo you can see the 2"x2" slats that I added to the existing 2"x6" framework to cut down on the amount of direct sun coming into the atrium. We are very pleased with their effect and feel they harmonize nicely with the beams.